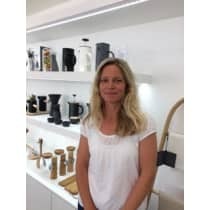 Cornwall boutique Coastal Scandi perfectly blends the backgrounds of its two founders - Sean, a home and interior designer, and Isabel, a Sweden-native who loves natural simplicity. The result is a boutique that understands good design and puts an emphasis on finding the best local brands and craftspeople to work with. "We like to select and support businesses that have a story to tell - the only problem is we need a bigger shop to fit them all in."